Chloe was abandoned by her mother so author Roseanne Glover raises Chloe indoors….much to her dismay, the little goat is quite a handful!! Funny antics and fact sheet on goats. 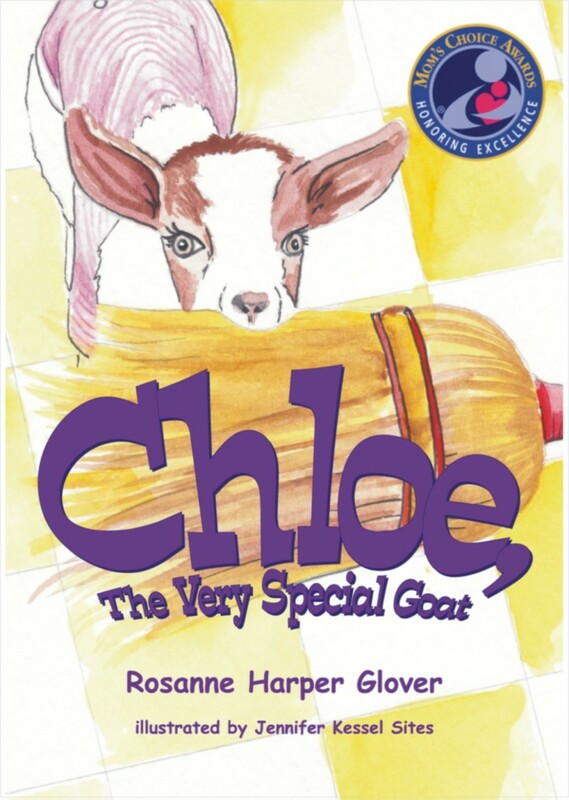 Chloe is definitely a very special goat and author Rosanne Glover brings this wonderful creature into a humorous and touching children’s book. Children and adults will love the adventures of Chloe as she moves inside after being cast aside as a runt on a snowy day. The beautiful illustrations by Jennifer Kessel Sites capture Chloe’s personality perfectly. Glover also includes the History and Science of goats, and a glossary of terms to expand the story into a wonderful learning tool for everyone who wasn’t lucky enough to have a goat grow up in their house! This story brought back memories. Mrs. Glover’s true story is educational and many readers will enjoy comparing their own experiences with pets to her interactions with a “farm animal. This story is definitely once upon a time; it is truly unique. This author has captured an incredible bonding with not the typical pet, but with Chloe, the Very Special Goat! She tells her story with tenderness and vivid detail. We visualize the antics of the little goat and hear her bleating but also we witness the compassion and care that revives an abandoned kid. The inclusion of reference material concerning goats and a positive message for all young readers is an invaluable resource to add to the delightful story. —Jo Ann Snyder Harman, 1996 West Virginia Teacher of the Year. Chloe’s story is a heart-warming adventure connecting the warmth of a parent with the needs of a rejected young goat. It pulls at your heart strings as you follow the often hilarious events in a goat’s life, fused with the strange happenings of a household. It’s an entertaining read for kids of all ages. Having been reared on a livestock farm and being a farmer, I have been a student of animal behavior. The behavior of animals is really no different than that of humans. Chloe’s experience as a pet and then being introduced to the trip is similar to a student attending a new school. At first, she was bullied and rejected; however, she conducted herself properly and eventually was accepted.